Klara Nahrstedt has been named to the inaugural list of “10 Women You Should Know” in networking and communications by Networking Networking Women (N2Women), a program of SIGMOBILE. Nahrstedt is the Ralph and Catherine Fisher Professor of Computer Science and the Director of the multidisciplinary Coordinated Science Laboratory at the University of Illinois at Urbana-Champaign. 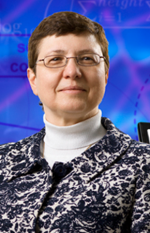 She is also a researcher with the Information Trust Institute on many efforts, including the Cyber Resilient Energy Delivery Consortium (CREDC).